This hearty aromatic stew is roughly modeled on the Leek and Bean Cassoulet with Biscuits recipe from Isa Chandra Moskowitz’s infamous Veganomicon. I had been considering the cassoulet recipe for a while as a fall dish for Harvest Noon, a cooperatively-run cafe for which I test recipes. However, another member mentioned that they had tried the cookbook recipe before and the final product did not meet her expectations. I could understand the upset – on the page, the recipe is a bit intimidating and requires lots of time. Mary at This Is Vegan documented her trial-and-error experience in an entertaining and informative read. Nevertheless, I really did not want to give up on this recipe. It fit the bill too well: vegan and gluten-free*, featuring seasonal Ontario produce, while avoiding curries and squash. (We noticed we were getting to be very reliant on those two ingredients). *A lot of the complication seemed wrapped up in the biscuits. I decided to scrap them right away as they would likely be a dealbreaker in the feasibility of the kitchen preparation schedule. Of course, the added bonus is that the dish is suddenly made gluten-free a s well. As it would happen, I am house-sitting for my parents this week while they are visiting friends in Provence. When I came home to get oriented for my stay, I was invited/instructed to use the produce in the fridge. 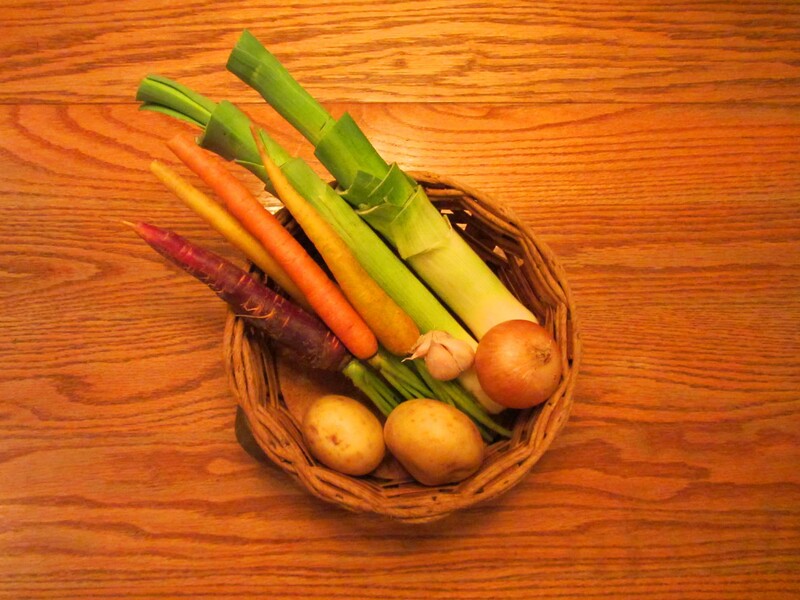 What should greet my eyes but two beautiful large trimmed leeks and rainbow bunches of heirloom carrots. On the shelf above, there was a small jar of leftover white wine right next to a chubby jar of smooth Dijon mustard. I started to pull things out of the fridge and on to the counter to visualize the work. In the corner of my eye, I saw the mortar and pestle crowded with dried sprigs of lavender. My mother has a few lavender plants around the garden and she is quite diligent at harvesting. I picked up a pair and thought of my parents in Provence, the land of lavender, where I had spent this past spring, volunteering on farms. During my 7 weeks there in Provence, I became obsessed with the flavour of thyme as well. 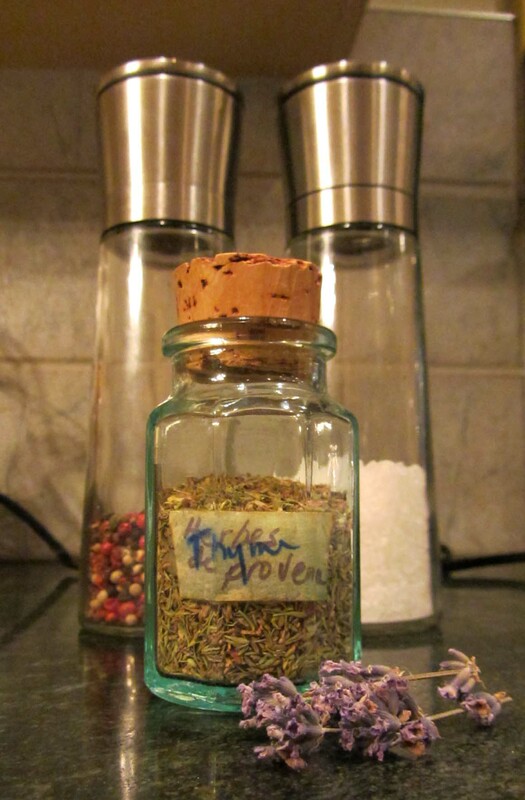 I opened the spice cupboard and the thyme bottle was front and center waiting for me. I decided to work with these Herbes de Provence and see what I could make of these ingredients. 1. In a small pot, cover the potatoes with cold water. Cover the pot and bring to a boil. Cook for ten minutes, until the largest chunks are fork-tender. Drain and put aside. 2. 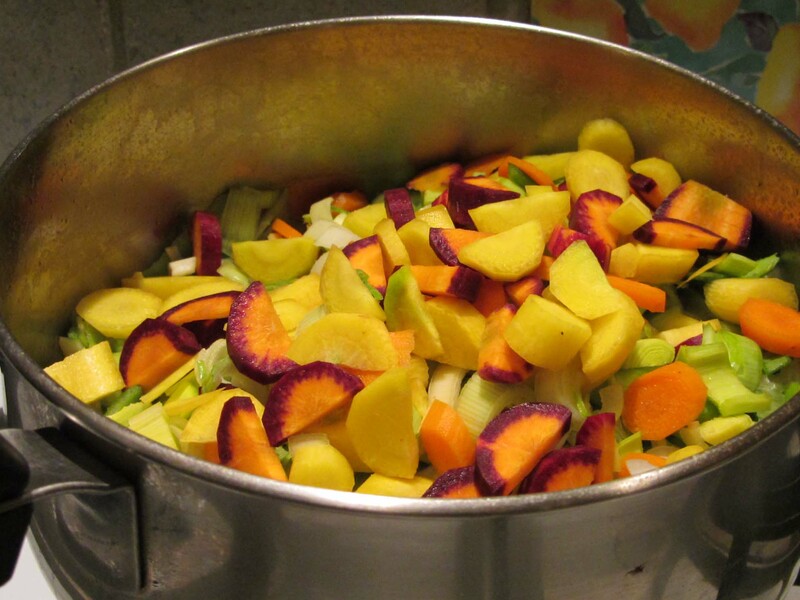 Meanwhile, in a separate bowl or measuring glass, add the mustard and cornstarch to the vegetable broth. Stir until dissolved. 3. In a large pot, heat oil on medium heat. Add the onion, leeks, and carrots. Cook for 10 minutes, until tender and starting to brown. Make sure to stir frequently. Add garlic, dried thyme and lavender, salt and pepper. Stir. Cook for two minutes. 4. Add the potatoes and the broth mixture to the pot. Stir and bring to a light boil. Add white wine. * Stir and let simmer, uncovered, for 30 minutes. *This moment may not be the conventional time to add the wine, but I had forgotten about it! Any which way, it turned out very well. I should admit that I tried to make it so that beans could join the party. I used the quick-soak method on some dried navy beans just before I started the vegetable prep. However, the initial boil must have been too light as the beans were still too hard 90 minutes after being covered. I was hoping to have the beans in there to add an extra heartiness. If you have any surefire tips on quick-soaking dried beans, I am all ears. 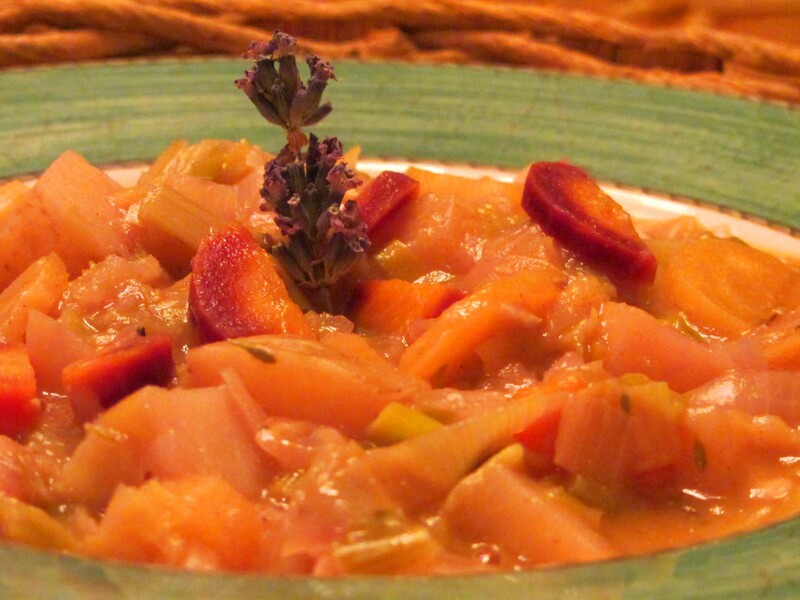 All in all, I am very pleased with this stew and I will make a case for it at our menu planning meeting this week. Any feedback is greatly appreciated! Enjoy! Sneak Peek: Gluten-free Autumn Latkes are up next! Sounds yummy. Two suggestions – save the potato water. It can be added with the broth and you may not need the corn starch. Add the wine when you’re sautéing the veggies. Keep up the good work! I love the blog so far. Great photos too. You possess an amazing collection of talents. Thanks for both the suggestions and the kind words! It was silly of me to blank on using the wine to deglaze while sauteing. Of course it makes sense to use it then! I will give the potato water a try next time and see how it changes the consistency. It is quite thick as is with the corn starch so one could consider cutting back on that too. ← Autumn Latkes: Vegan, Gluten-Free, AND Baked? !